You're learning what is of heartfelt importance to you. You're better at bringing your focus back to the present. To look back and see how far you've come. Don't sweat the small stuff! Let it go. In the grand scheme go things, is it really that big of a deal? Don't stress about all that you have left to do, dream about, and accomplish. You know it will happen when it's meant to, so there is no need to attach to outcomes. You have an appreciation for the process of letting go. You've gotten better at releasing! YES! Although it is never easy, the more you do it, the better you become at surrendering. You realize that releasing is vital to the health of not only your immortal soul, but also your human body. You can recognize a good release by the way you stand taller, your shoulders relax, your neck muscles aren't as tight. Everything about your energy is just lighter! You understand the value of slow steady growth. Is a weed that sprouts up over night stronger than a great oak? You take time to stop and smell the flowers. To relish in the experience. To sink-in to the journey. To allow the road, your soul purpose, to become part of the way you walk and talk. You're not in any rush - where is the fun in that? You'd rather savor every moment, every lesson along the way. That way you really learn them- maybe even the first time around! Strong foundations are important to you. You want your knowledge and experience to have a backbone. Something to stand on that speaks all for itself. You've learned some warning signs - who and who not to trust. You have become a better judge of character (by getting to know yourself), but not judgmental - you just know who you would like to invite into your energy and who you'd rather keep at a bit of a distance. You know to pick your battles wisely. To not feed into another's negative behavior. To not get wrapped up in other people's drama - remember, not my circus, not my monkeys. You understand the insanely crazy value of setting boundaries and how it is a benefit to not only you, but also to others in your life as well. You're getting better at that little thing called Self-Talk. You've been working on healing thoughts of a comparing nature. You understand that the grass really isn't always greener on the other side, but you are too busy focusing on pulling your own weeds, sowing seeds, and spreading fertilizer to notice your neighbor's lawn. You've become better at freeing yourself from self-oppressing thoughts, self-sabotage, and lower vibrational patterns of behavior. You truly know the worth of thinking positively and the power of your own manifestation abilities! You have a ton of excitement and hope for the future! You can over come anything and you know that now! You see all of the remnants of past challenges behind you - in a cloud of smoke, lying in the dust. You tore threw them like a hurricane (even though it may not have felt that way in the moment). You are more sure of where you want to go, what you're looking for, and have a better idea of how to get it. You know where to look for opportunities. Understand the value and deep worth of self-expression. You're better able to determine when and when not to take action. You're more daring and ready for new adventures! What have you learned on your journey of awakening thus far? What lessons are you currently grappling with? I'd love to hear your insights! Have your Spirit Guides been trying grab your attention? Was that a message from my Spirit Guide? How do I know when my Spirit Guides and Angels are close by? I feel like they may be trying to tell me something but I'm just not sure if it's my imagination or not? If you're unsure as to whether your Spirit Guides are trying to relay a message to you, here are some great tips to help you know when your personal Spirit Guide entourage may be near! For years I would get the chills and not know why. It could be 90 degrees outside and I can get a case of the shivers. And it's not that I would be cold, or feel cold when I got them - it was just my body reacting to something and I just didn't have a clue what it was! I accepted it as one of my quirks and moved on. However, after many years of my life with this mystery, I discovered that this is in fact a sign from my guides and Spirit! In my experience, when my Spirit Guides or Spirit (departed loved ones on the Other Side) are close, I will get the shivers unexpectedly. Almost like a rush of wind just goes through you. This is when your guides (or Spirit) step into your aura or your energetic field. You are sensing the change in vibration of your energetic field. 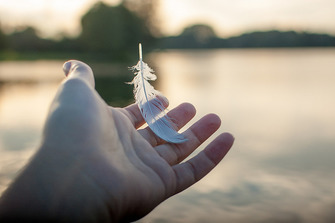 Gray Feather - it may be time to find clarity in your situation, just ask us for help! For me, this is particularly noticeable on my back or shoulders. It gives off this feeling of protection like my guides are saying "We literally have your back." There's definitely an increased sense of safety and security when I feel my guides around me. Sometimes the feeling of warm, golden energy is lasting. 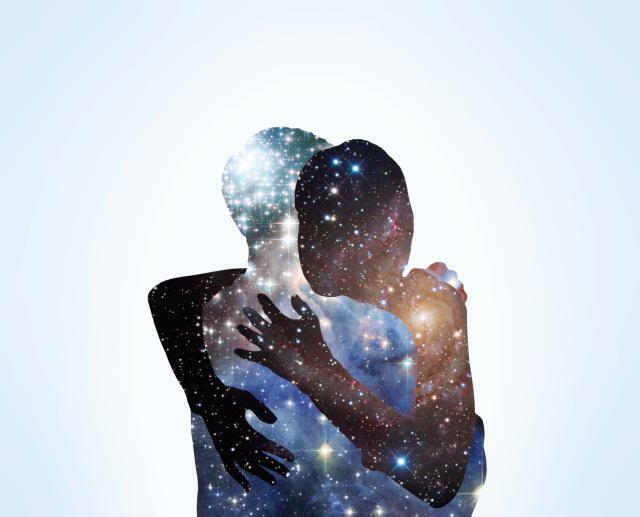 You feel enveloped in warmth and protection. In terms of feeling a tickle on the skin, that can be quite fleeting. By the time you notice it, it may be gone. Your guides are just checking in and saying 'Hey!' I often feel this as briefly as a peck on the cheek or a brush on my shoulder. Seeing repeating numbers (also known as Angel Numbers) are a very synchronistic way that your Spirit Guides (and Angels!) may communicate with you. If you are seeing the same number pattern over and over, such as 111, 378, 444, 656, 333, 989, 542, 888...etc. there is definitely a message there for you. Look up the meaning of the numbers you keep seeing. For me, it is always a helpful message about my guides being with me, letting me know I may need to change my focus, or giving me loving encouragement on my path when I need it most. 5. A name you keep hearing - What's in a name? Let's say for a moment that every time you go into meditation, you keep hearing a name over and over again. 'Foster...Foster...Foster' Yes, this could be a message from Spirit, but it could also be the name of a Spirit Guide who is trying to work with you! Here's a tip: If you ask your Spirit Guide for their name, go with the first name you get. Then look up the meaning of that name. I always find something extremely profound when I do this. This can also really help you to form a deeper relationship with and understanding of your Spirit Guide. In meditation, you may keep seeing a recurring symbol, let's say a conch shell for example. It is troubling you because somewhere in your 20 minutes of meditation this symbol keeps popping up meditation, after meditation, after meditation. This is a HUGE sign from your Spirit Guides! The conch shell is a symbol of truth. Is there a situation in your life where honesty and truthfulness is a concern? My most recent recurring symbol was the crystal Amethyst. I would wake up in the morning hearing and seeing this stone over and over again. At first it was maddening until I took the time to connect with my guides and say 'Hey, what's up with this?' Upon further exploration, it made total sense that my guides wanted me to work with this crystal more to help deepen my connection with them. Always look up the symbolic meaning of the sign or gift you receive in your meditation. And if your still unsure, just ask your Spirit Guides for clarification - they may be trying to tell you something that could lead to a big breakthrough! You keep feeling the nudge to move to a new city, change careers, or ask that person you think is super cute out on a date. You're not sure where this nudge is coming from but yet it keeps pulling and tugging you in a certain direction. Trust this! This is more than likely your guides dropping hints, giving gentle pushes, and whispering in your ear as to which path you should take. It may even lead you closer to your Soul's Purpose and your destiny! Please note, a Spirit Guide is of the highest vibration and will NEVER encourage you to do something that would be harmful to others and that is not for your best and highest good. *Bonus: That motivational quote was so on point! I love how our Spirit Guides can lay little bread crumbs on our path such as motivational and inspirational quotes. These are synchronistic happenings that resonate deeply with your soul and what you are going through at the moment you read them. Automatically you know that you were meant to see this. That it was laid in your path just for you. Your Spirit Guides gave you the smallest of inklings to check your Instagram feed or open to a certain page of a book and there it was! This is a sign that your Spirit Guides are around you supporting you and your tribulations, they see and understand what you are going through, even though you may be feeling like you're going it alone. I hope this has helped you to give you some hints as to when your Spirit Guides are near (which is always) and what they are trying to tell you!